Innovative lightweight technology enables volume production, is affordable and hybrid. That’s why the BOGE Rubber & Plastics Group has developed an additive manufacturing process for endless fiber materials. It is applied to brake pedals, a security critical component – 40-55 percent lighter than steel, fully automated and quality controlled. Core of the process is the local adaption of fiber architectures by printing unidirectional reinforcements (UD-Tapes) to organo-sheets. In a second step these tailored blanks are then draped and consolidated in a way, that fully welds the tapes to the organo-sheets. This makes mechanical properties of endless fiber-shells programmable. Increased fiber efficiency reduces the amount of equipped endless fiber materials by 30 percent, reducing wall thickness and thus weight and cycle time. 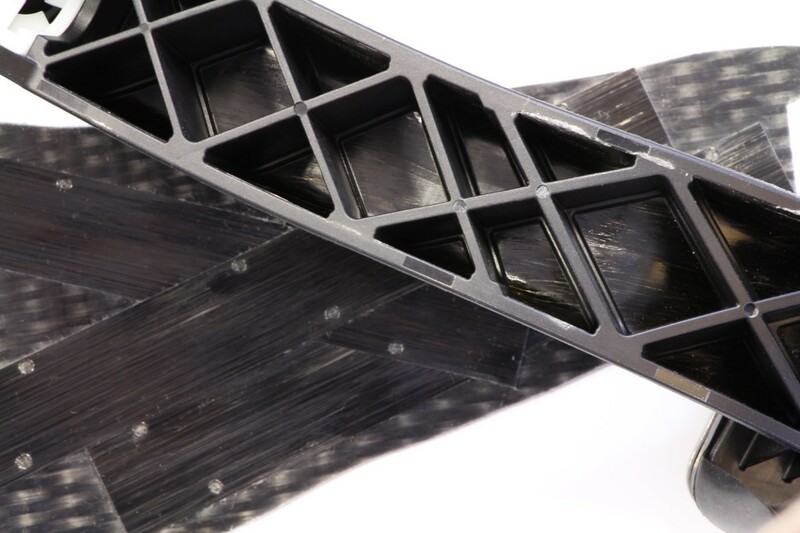 The BOGE Rubber & Plastics Group has developed an additive manufacturing process for endless fiber materials. It is applied to brake pedals, a security critical component – 40-55 percent lighter than steel, fully automated and quality controlled.